May 2, 2017 May 1, 2017 by Beau H.
So, you’ve picked up your new favorite pair of light wash denim — or at least, you’ve thought about it. Now, how do you wear those jeans? Well, there are a few moves that’ll help you take on spring in style — unlike pairing dark selvedge denim with sturdy leather boots and a thick shawl cardigan for winter, the focus today is on keeping things light, breezy and fun. That means we’re grabbing an essential spring polo and a classic cotton bomber jacket, all the while focused on dialing in the fit of your light wash denim. In the warm, breezy days of spring and summer, light wash denim just fits in with the weather and the atmosphere. Trust me on this: You’re going to want to wear light wash jeans as much as you can this summer — particularly when those jeans are made in a unique wash and feature a slim fit. That means that from spring road trips to summer music festivals, slim light wash jeans should be a go-to move — and it doesn’t get better than the Abercrombie light wash denim seen here. You know Abercrombie and Fitch for the brand’s stylish, durable winter gear, and that same attitude carries over to its spring line. If you have other questions on how to wear your light wash denim, or if you just want to get in touch, hit me up on Twitter or join me over on the ‘Gram for style inspiration on the daily. Mixing the sporty and the classic for essential spring style. The Denim: Abercrombie and Fitch Super Skinny Jeans, $39 — If it’s slim, of-the-moment style that you seek, look no further than this vibrant pair of washed denim, made with a hint of stretch for comfort. For options that feature a more forgiving cut, look toward Straight or Slim options via Mott and Bow. The Jacket: La Paz Ortigao Bomber in Almond, $275 — We first brought this jacket to your attention in our post on how to dress for a spring road trip — and well, it’s back again thanks to its unique color and lightweight construction. 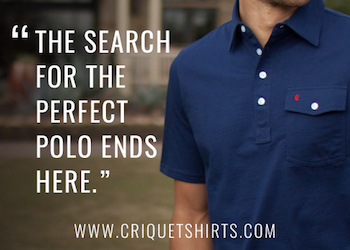 The Polo: Criquet Shirts Slim-Fit Player’s Shirt in Midnight Cowboy, $79 — For easily wearable style that looks sharp underneath a bomber jacket or on its own, it’s tough to top a classic navy polo like the Criquet Slim-Fit Player’s Shirt — especially one made with organic cotton jersey fabric. The Sneakers: House of Future Original Sneaker in White, $76.98 — Who doesn’t love a pair of classic leather sneakers? Especially the House of Future Original Sneaker — these are sharp and feature a crisp, slim profile for an agreeable price. The Socks: Darn Tough No Show Ultra-Light Cushion Socks, $29.98 — No-show socks can be a surprisingly tricky item for which to shop — you want comfort and quality, and you get that with the Darn Tough No Show Ultra-Light Cushion Socks. The Belt: La Matera Bariloche Belt, $145 — If you want to step up your #menswear accessories game in a big way, reach for a casual belt — say, the La Matera Bariloche Belt — that blends vintage fabric, a neat pattern and cool color. The Watch: Jack Mason Aviator Chronograph, $275 — For handsome, smart and casual style that still looks extremely sharp and put-together, the Jack Mason Aviator Chronograph is the watch you need now. The Sunglasses: Norton Point Charlie 014 Sunglasses, $145 — For seriously cool style, reach for retro-inspired sunglasses that add some sporty appeal to the La Paz Ortigao Bomber. Feeling comfortable with how to wear light wash denim now? At least a little bit more comfortable? If you haven’t quite come around to the idea of light wash denim yet, the key here involves taking pieces that you’d already wear in warm weather — like the Criquet Slim-Fit Player’s Shirt — and mashing them up with sporty-yet-casual pieces (such as the La Paz Ortigao Bomber in Almond. Add in supremely classic and clean white leather sneakers like the House of Future Original Sneaker , and then accent that casual combo with the beautiful and just plain badass Jack Mason Aviator Chronograph. Oh, and don’t leave your shades at home — there’s no doubt that you won’t forget the Norton Point Charlie 014 Sunglasses, what with a retro-inspired design and cool looks. In short, all of these pieces work on their own — and they particularly work well together for all manner of spring style pursuits, from a ballgame to a weekend coffee date to a spring road trip. Especially that light wash denim. Ya feel me on that? Good.